I have to put something up here, because (1) I hate the title of the last post being the first thing one sees upon stumbling across my blog (2) It’s just been tooooo long since I’ve posted and (3) I have something(s) to share. And, let’s be real, the other reason MUST be that I’m not taking the time to “think”. Don’t you know it takes time and energy to really “think”?? Here are some things I’m thinking about. I may or may not expound on some or all of these things in later posts. It depends on how much time I devote to thinking about them. Election— the country appears to be split in half–1/2 for one candidate, 1/2 for his opponent. This division can NOT be good for our country. (Mark 3:24, Matt 12:25) But then again, this is generally what happens every 4 years, so maybe it’s not that big of a deal. Either way, I’ll sure be glad when it’s over. Praying–Does effective prayer require ENERGY and effort? Be joyful in hope, patient in affliction, faithful in prayer. Rom 12:12 Perhaps I’ve failed in this area in the past…not prayed enough, or prayed hard enough, for my son….who now could possibly be described as a prodigal. 😦 Is it my “fault” for not praying hard enough? of course not, but that’s not gonna stop me from praying harder NOW. I miss him. Being legalistic about “rules” instead of focused on relationships can hurt people–Mark 7:8,9 “You have let go of the commands of God and are holding on to human traditions.” Not that right and wrong are NOT absolute, because you can argue that they are, but that relationships matter MORE than right and wrong. …Just some of the things I’m stewing about lately. Can’t close this post without a photo. 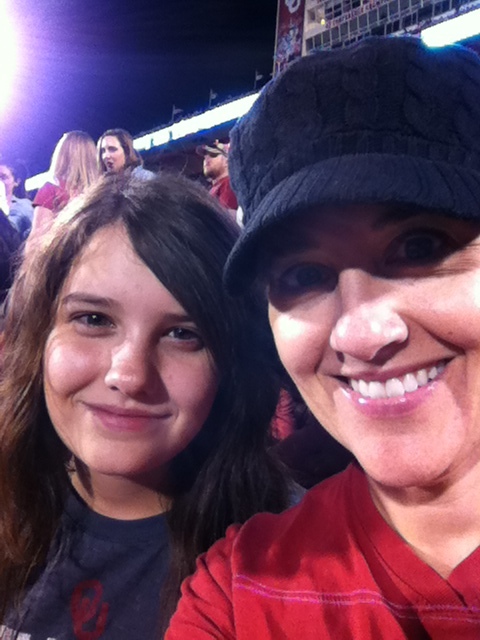 Here is a shot of me and Cam at the OU-Kansas football game. She sure loves her football. I just go to the game if the weather is perfect and for the fun atmosphere.